As I mentioned in an earlier post I am embarking on my first adventure using D&D 5th Edition and I'm going to chronicle my journey (and that of my character) as a series of blog posts. 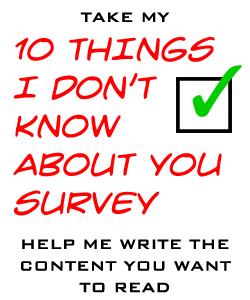 The format will be character journal entry and then my take on the rules. This being the true and reasonably accurate account of the misadventures of Forest Gnome Barbarian Hermit Tynka Azolla. He's insane but harmless and cries out in his sleep when troubled by the dreams of the 52 black birds and the missing Iles of Cruise, visions of the war between the hawk men of the Capitol and their enemies the Coh Mees of Uesesah. He rambles prophetically about The End of Days when the high priest of Potus spoke to the the amureeckans and told them to go forth and shelter from the fall. I was out picking berries to make a poultice to calm his dream time when a great black shadow passed over the forest, followed by a raucous cawing. When I got back to the ruin it was a shattered mess. There was no sign of the old man or the egg, but in the sky I could see a great bird travelling South. I grabbed my travelling pack, glad that my father had trained me well to always be ready to move at a moments notice and headed South. On the third day I found the hermits body among the flat rocks at the bottom of the waterfall. He had been split open and his insides torn out, great claw scratches littered the rocks among the blood, feathers and viscera. Whatever swooped down and snatched him up had decided to eat him. The egg was nowhere to be seen, so I blessed the old man's corpse and continued South. The hermit had taught me that a great evil resided in the egg and should it be released it would consume the world in destruction, my mission to find the giant bird and retrieve the egg. Eventually coming to a great coastal settlement I found many people who had seen the great bird always heading south. Some said that it must be headed to the Isle of dread. I found a merchant who was assembling a trade ship bound for the Isle. I lied to him about my past but he believed me and I am now one of his bodyguards. We set sail on board a ramshackle ship bound for the Isle. 10 days later we approached the archipelago when an ungodly storm came out of nowhere smashing our ship to pieces and I jumped overboard to save myself. We woke up in the beach battered but alive, a heavy mist obscured the horizon so I went inland in search of fresh water, food and foliage. It was then that the giant crabs attacked, I killed one with my javelin and almost killed two others who were attacking Kendrick the merchant and some of the other survivors and sailors. 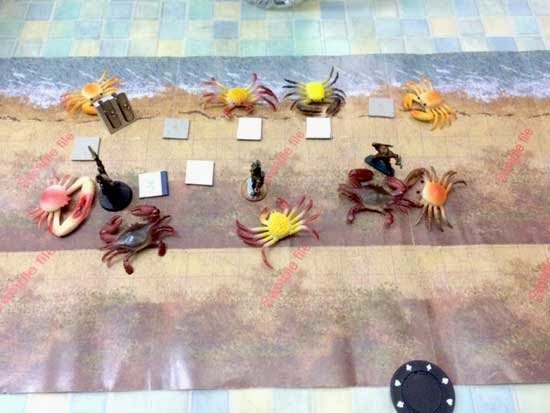 Giant Crabs attack the PCs (yes the pencil sharpener is a PC) and survivors on the sample file beach. When the mist cleared it was clear that we were on a sandbar and the ship had hit a reef a sort distance away. It was heavily damaged but intact if we are to survive we must construct a raft from the flotsam washed up on the sandbar and make our way back to the ship to gather supplies. My character is a truly random creation. Race & Class were randomly rolled and Attribute scores were determined from a best of three sets (using 4D6 drop lowest method) then placed appropriately and Race/Class modifiers applied. This resulted in above average STR, INT and DEX scores but a truly awful WIS. The use of predefined "packs" is an excellent answer to long complex equipment lists and gets you up and running in no time. Similarly, I really liked the background aspects of the new character gen system (Personality Traits, Ideals, Bonds, Flaws) which will be of immense help to new players and create some really interesting combinations. I'm a big fan of the way Castles & Crusades / SIEGE system resolves Skill/Attribute checks so I feel quite at home with the new slimmed down skills list and proficiency modifier system. Gone are all those horrible 4e Powers which made even a low level game sound like you were in an 80s anime and drove you nuts tracking Class Feature / Race Power / At Will / Encounter / Daily usage. Coming around after the shipwreck encounter, I received my first Disadvantage token, which was a real shock. Although it only applied to skill checks it really had an adverse effect on my play. I could not catch a break and I failed all subsequent skill rolls. I'll reserve judgement on this until I've benefitted from Advantage but I'm leaning towards favouring a static positive/negative modifier as I feel it's effects might be too random. Combat seemed way more streamlined and faster than 3.5/4e with a return to the simpler bash/bash mechanics of earlier editions. It may not be terribly realistic, but it gets the job done with the minimum of delay. Supermarionation fans are going to have an FAB 2015 as they celebrate 50 years of Thunderbirds. In April ITV launches it's semi CGI remake of the classic series Thunderbirds are Go! and Modiphius have teamed up with Pandemic designer Matt Leacock to make a Thunderbirds Co-operative Boardgame and RPG currently going through the crowdfunding motions on Kickstarter. Withing minutes of hearing about it, I backed it. Game components look top drawer and with the extra RPG stretch goal already unlocked, it's two games in one. Can't tell how it will play, but if Pandemic and Forbidden Island / Desert are anything to go by this should be a crowd pleaser. Whilst you're waiting for this to be delivered check some of the stunning models created for the new series by WETA Workshops. I can't wait to see how it looks with the CGI characters added in. After 30+ years of GMing my mind is beginning to fill up so here are some of my observations, creations and things I find on the web which I hope you will enjoy.